There was not even a shot on target, never mind a goal, for United who nevertheless go to the Nou Camp for next week's return leg believing they still have a chance. After all, they lost 2-0 to Paris Saint-Germain at home in the last round before turning that around so famously although, to be honest, Messi and Co represent a more formidable prospect even if they did not play well here. They will surely not be as wasteful at home. 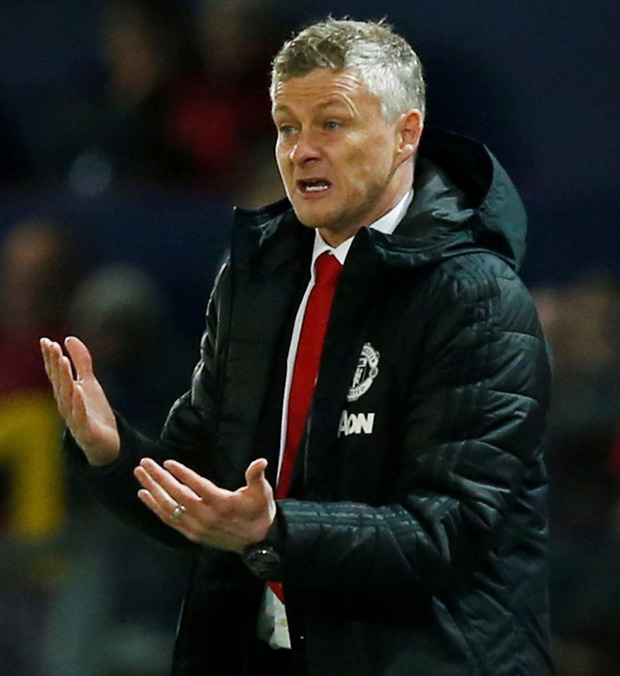 Ole Gunnar Solskjaer will summon the spirit of 1999, but despite the endeavour against Barcelona, especially in a much-improved second half, it is now four defeats in five games in all competitions since he was confirmed as manager. Messi received his facial injuries after being caught by the flailing arm of United defender Chris Smalling who had talked about "bringing it on", but United did not do enough although they may feel aggrieved they were not awarded a first-half penalty while Barcelona's serial fouler Sergio Busquets was also treated leniently. United were undone by an own goal, albeit at the end of a mesmeric passage of 48 passes from the Spanish league leaders. From kick-off what were United's tactics? Solskjaer emphatically fixed a five-man defence, with Luke Shaw puzzlingly on the left of the centre, and it was unpicked - far too easily. Barcelona are too good to be thwarted like that, and so it was that Messi's clever run was spotted by Busquets with the forward twisting and turning and standing up a superb cross that Luis Suarez headed goalwards. The ball brushed off Shaw's arm and bounced into net as Philippe Coutinho dived in to try and get a touch, which he did not. As Barcelona celebrated, the assistant referee flagged, and it was ruled out, to the jeering delight of the United fans, for offside. Then, that decision was overturned by the VAR and Barcelona were a goal ahead. It felt unsatisfactory, but the fact is it was the right decision, and an injustice had been avoided due to the technology. Playing Shaw out-of-position was simply not working, and he was caught out, fouling Messi and earning the yellow card that ruled him out of next week's second leg. Meanwhile, Solksjaer did not start with either Anthony Martial or Jesse Lingard, with the attacking onus even more on Marcus Rashford, who was declared fit after recovering from an ankle injury. Fate meant these two sides met a month short of the 20th anniversary of United's treble-winning triumph in 1999, a campaign that included two 3-3 draws with Barca in the group stage and, of course, Solskjaer's injury-time winning goal against Bayern Munich in the final. Since defeating United in the 2011 final, as they did in 2009, Barcelona have not progressed beyond this stage of the competition but appeared far superior in the opening exchanges to a side feeding off scraps, playing the underdog. As 20 minutes passed, Barcelona claimed 87 per cent - 87 - possession, with three players, Ivan Rakitic, Arthur and Jordi Alba individually completing more passes than the whole United team. Despite that, Barcelona were careless at times, and as United pressed, the ball was turned over with the impressive, positive Scott McTominay breaking into the area and going over under Gerard Pique's challenge. The penalty appeals and chants of "VAR" were waved away before a break in play as Messi received treatment, and United regrouped by switching to a back four with Shaw in his usual position and Diogo Dalot in left midfield. As play resumed, Coutinho brought an alert save by David De Gea with an outstretched leg from his skimming snap-shot after the ball was laid back to him by Suarez before United finally threatened as Rashford picked out Dalot beyond the far post, only for him to head back across goal. He had to do better. So did United, so did Solskjaer, given that Barcelona did not even have to play that well to take a lead and a clean sheet into half-time. After the break, United finally took the game to Barcelona, with Rashford unfortunate to miscue a volley in the area after goalkeeper Marc-Andre ter Stegen punched a clearance straight to him. The crowd responded; this felt more like a contest, with United again unlucky as Fred's pass just ran away from Rashford as he threatened through the middle. United were committing players forward with Paul Pogba and Dalot further up the pitch, and at last Barcelona were under pressure. De Gea turned away Alba's low shot from Messi's astute pass at his near post with Solskjaer then turning to Martial, replacing the ineffective Romelu Lukaku who had just 19 touches, the fewest of any player. The forward ran on to McTominay's through ball and just as he threatened to shoot Pique made a vital intervention. But United could not fashion a chance and Barcelona, firmly, have the advantage if not quite the knockout.